A near derelict college building stands condemned and menacingly awaits the bulldozers. A group of young students volunteer over the Christmas holiday to clear it of the remaining furniture. An insane killer in the building however, has other ideas; and when the lights flicker and fail - the horror begins. A violent and grotesque death is waiting for the students who one by one are stalked by the maniac. As the terror mounts the blood in torrents begins to flow and the only Christmas present they can expect is to die! 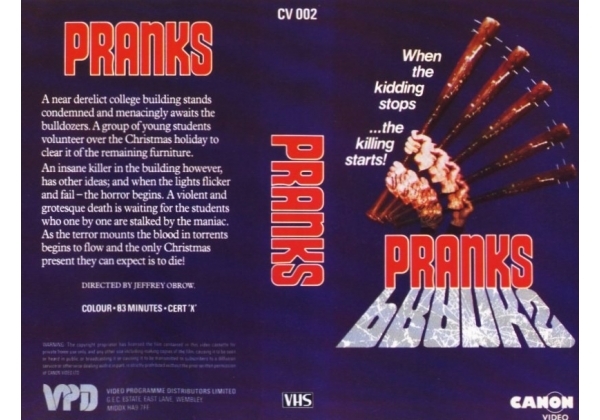 Or find "Pranks" on VHS and DVD / BluRay at Amazon.